These games are not available for purchasing or rent through us but are available for us to host for you. 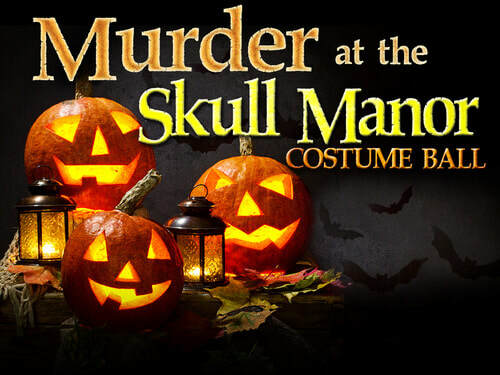 Synopsis: It is time again for the annual Skull Manor Costume Ball! Skull Manor is an old estate in the heart of Spider City known for its captivating architecture, mysterious ambiance and unspeakable history. The townspeople have been scurrying about the streets to get ready for the big night of great food, inspiring conversations and, of course, outrageous gossip. This has been a daunting year of dissension and discord among many of the residents of Spider City. Rumors of blackmail, thievery, and scandalous controversies have been circulating throughout the town’s grapevines. We all hope everybody can put aside their differences for a night of fun. If not, there may be misfortune on the horizon. This is where your story begins. Gender: All female or co-ed; 5 females required. General Costume/Attire: Mostly semi-formal, a ballerina, popstar, etc. 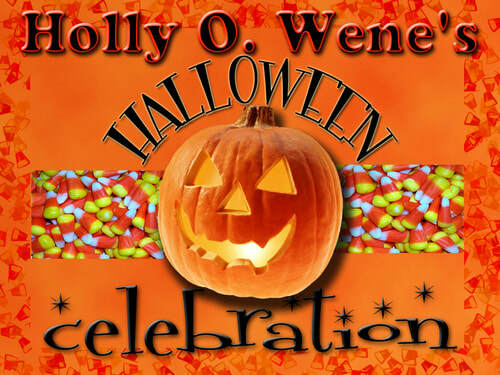 Synopsis: Holly O. Wene is famous for her exciting Halloween celebrations. Year after year people flock to their mailboxes during the month of October in hopes of finding an invitation to her bash. Halloween’s around the corner and the who’s who of Pumpkin Town will be soon be arriving to Holly’s mansion wearing the most creative Halloween attire, and ready to play fun Halloween party games, and dine on delicious spooky snacks. The town’s pumpkin patch owner, Mrs. Polly Pumpkin, plans to make a special announcement this year at Holly’s bash. The town gossips are dying to find out what Mrs. Pumpkin has to say! Polly Pumpkin’s Pumpkin Patch is the preeminent spot to pick out your Halloween pumpkin in the entire world. Rumor has it that Mrs. Pumpkin plans to retire and is seeking an heir to carry on the family business. Sources closest to Mrs. Pumpkin say there may be challenging mysteries to tackle and scavenger hunts to endure before she selects a grand prize winner. A lot is at stake and this is a once in a lifetime opportunity! You’ve received your invitation to Holly’s party. This is where your story begins. Synopsis: Three weeks ago, the cheery town of Sunnyville was hit with a devastating plague that turned the living into horrifying undead zombies. The H5N1 zombie virus spread and the zombie population dominated the living within Sunnyville. The zombies staged a revolt and took over the government. The Center for Disease Control quarantined the town, and the feds threatened to eradicate the zombies to prevent spreading of this viral nightmare. 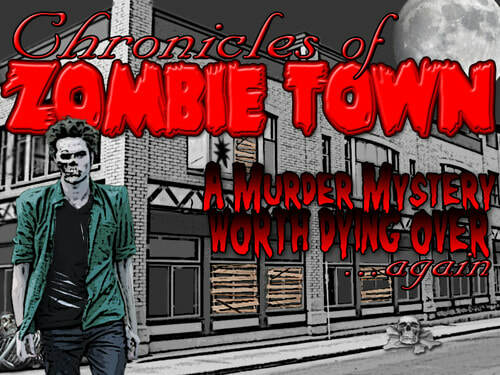 Nonetheless, the citizens of the newly-formed Zombie Town weren't the stereotypical aggressive monsters portrayed in movies, television and comic books. The citizens were simply dead and decomposing but the same as before - upstanding citizens! There was one gruesome exception: the virus gave them an intense craving for living human flesh! A mandatory vaccine against the H5N1 zombie virus was given to the human population outside of Zombie Town, and the epidemic ended. Soon after, human rights activists caught wind of the situation in the former Sunnyville (aka: Zombie Town) and formed the Save a Zombie Alliance. Millions banded together and persuaded the government to sign an unprecedented peace treaty with the zombies. Ashes, the self-acclaimed Emperor of Zombie Town, negotiated the truce with the President of the United States. The major clause in the treaty was that zombies would not cross the borders of Zombie Town unless on a sanctioned journey, and they would never hunt living humans for food outside of their borders. With mandatory warning signs posted for miles surrounding Zombie Town’s borders, there was an addendum in favor of the zombies that if a living human ended up inside the borders the town, hunting and capture was allowed. Ashes set forth the laws of Zombie Town, and the treaty was to be signed by both Ashes and the President of the United States within 24 hours. The citizens were happy to be at peace with the feds.